twist In an interesting and potentially tragic twist, the latest Liberal affront to the members of Canada's Armed Forces comes under the guise of spending, instead of routine denials of the need to increase the military budget. defence The Liberal Government is now coming under fire for the purchase of replacement executive jets for the Prime Minister and fellow cabinet members for approximately $100 million. It is not the fact that this purchase was made against the advice of the Department of National Defence, nor that it was made on the final day of the fiscal year just prior to a parliamentary recess assuring virtually no public scrutiny that makes this issue so infuriating. Rather it is the statement this government is making to the members of the Armed Forces that it values their lives less than it values its own. emergency In defending the purchase, the Prime Minister pointed out his own personal experience in emergency landings in these aircraft. incident DND records indicate only one such landing took place, and that was deemed to be an isolated incident not indicative of the condition of the aircraft. 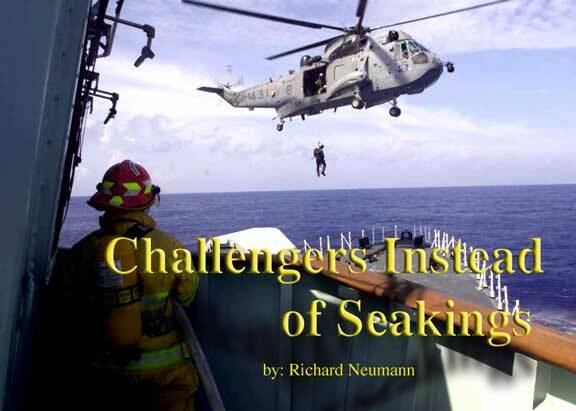 Even if the Prime Minister was so shaken by the sudden cabin depressurization and subsequent safe decent, his experience pales in comparison to the almost routine mechanical failures of the SeaKing Helicopter . 9 years It has been nine years since his government cancelled the replacement program at the cost of $400 million. dozen During my time in the Navy, ships in which I served were involved in at least a dozen emergencies and in-flight mechanical failures, and that was over six years ago. expedience If the PM and cabinet were so concerned about their own safety over a single incident, I would suggest that they take a long look in the mirror and ask themselves if it is appropriate that they continue to ask members of the Armed Forces to take far greater risks on a much older aircraft, all for the sake of political expedience.